A home loan, or a mortgage, is just like any tangible part of a home; it can be replaced. Appliances get updated or replaced due to improvements in efficiency. Carpeting, paint schemes, furniture and décor are replaced in order to accommodate different needs or to stay current with modern styles. A mortgage can be replaced for a number of reasons and all of them can be beneficial to the homeowner. This is especially true in the case of qualified Veterans who wish to use the VA mortgage program. One of the best reasons for using a VA mortgage to refinance an existing loan is the fact that your loan amount can go as high as the appraised value. If a home currently has a loan provided by Fannie Mae, Freddie Mac, FHA, USDA or a private bank then the VA will allow veterans to refinance that loan to a VA mortgage and borrow up to the home’s appraised value in order to complete the loan. This is a great benefit since most other programs limit the borrower to less than the total value of the home. While the VA does charge a funding fee for each of their loans, the funding fee is added on top of the loan amount in order to allow the veteran to refinance without paying anything from their pocket. The VA program offers two types of refinance options. First, there is the cash-out refinance referenced above. This loan will ask the borrower to provide the customer proof of income documents as well as a full credit report and full appraisal for the home. 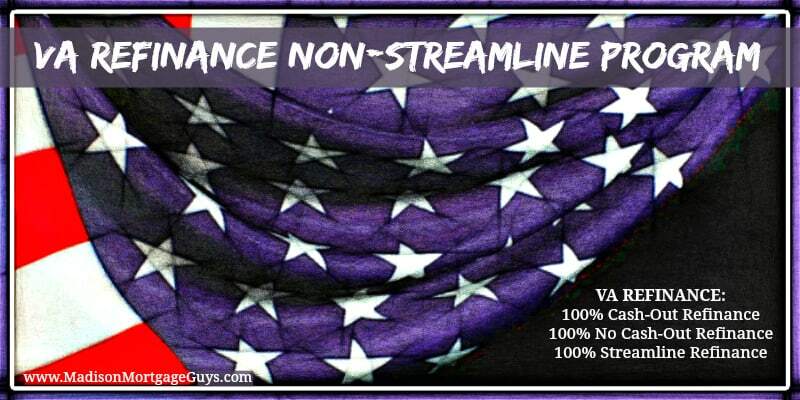 There is also a VA streamlined refinance. For veterans who currently have a VA mortgage this type of refinance is ideal for lowering their interest rate with only a fraction of the paperwork. As long as the veteran has made the last 12 mortgage payments on time they stand a great chance of getting approved for this loan. There is no requirement for a full appraisal or a complete application with proof of income. Any veteran that has not refinanced to a lower interest rate in the past few years would likely see a real reduction in their monthly payment if they chose to refinance while the rates are still low. Besides offering a true no money down loan the VA mortgage also uses proven underwriting rules to approve qualified veterans for loans. The first rule is the debt to income ratio. While many mortgages have a specific ratio for comparing the mortgage payment to the borrower’s income, this is not true with the VA loans. The only ratio test is an overall debt to income comparison which cannot be higher than 41%. In addition, the VA has residual income rules.This rule states that a veteran, depending on the number of people living in the home, must have a particular dollar amount left over after all other bills are paid. This guideline prevents veterans from borrowing too much and finding themselves in deep trouble with their finances. Thanks to their sacrifice to our country Veterans are offered one of the premier forms of lending for home ownership whether it is for a purchase or a refinance.